Flat Mop Feature: The mop has a large frictional force, which is easy to clean the hair dust; it can be dragged dry or wet, and the decontamination ability is strong. The mop is derived from the rag. When the ground to be cleaned is mud, people may just want to sweep it off, and may not want to wipe it off. With the advancement of productivity, changes in the living environment, and the need to clean the ground from mud to smooth planks and slate, the need for scrubbing arises. The first application to scrub the floor is a rag. Although the scrubbing cleaned the ground, the first problem for the operator came – too tired. The problem is the source of inspiration. Someone installed a long handle on the rag. Oh, the difference between the world – the benefit has been seen, and the name of the image – “mop”. The mop came to the world. 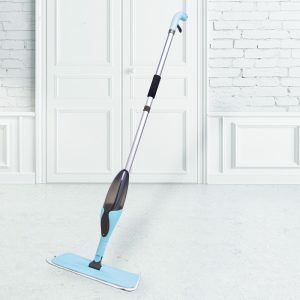 Achieving “upright walking” Its biggest feature is to ensure the inheritance of the water-cleaning function of the water-sweeping mop, while the material of the working head changes, using polyvinyl alcohol cotton. The rubber has a strong water absorption and can fully guarantee the cleaning work. At present, the main changes are carried out around the function of squeezing water. The main types are: (1) roller squeezing water; (2) squeezing water on the board. 1. Pulling the chain design, the operation is simple. 2. metal rod spray, durable and rust-free, and has a retractable feature. 3. high-quality PVA rubber head, water absorption is very strong, squeeze the water is very dry. 4. the scope of application: wood flooring, marble and all kinds of porcelain flooring, glass windows, kitchen porcelain wall cleaning. 5. cotton head replacement is convenient, easy and labor-saving. Features: This mop has been very popular in the past two years. The mop head subverts the traditional round head and uses a flat design to fully support the bottom plate and the ground. The mop is made of fine cotton yarn and microfiber fabric, which is easy to wipe off the dust between the gaps and corners. At the moment, many products also have a card towel setting, which can be easily installed with a variety of used towels, and can be equipped with a special towel to wipe the glass and windows. 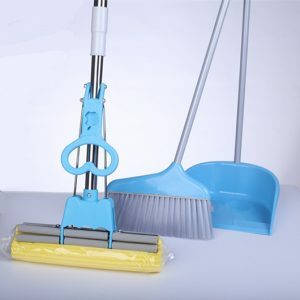 Features: When it comes down, some manufacturers have improved the cotton support head, using a fiber cloth that is easy to absorb water, and equipped with a bucket and a wringer, which makes the operation of the mop much more convenient. This kind of mop is light, small, exquisite, easy to use, effortless, and the floor is relatively efficient. 1. The head of the water suction mop needs to be kept moist frequently. If it is not used for a period of time, it will become hard. When using it again, it must be referred to the first method of use and can be used again before it can be used. 2. Some people have towed the floor and washed the mop head. They like to expose the balcony to the sun. The water-absorbing mop can never be used. This will promote the aging of the rubber head and remember not to expose it to the sun. Grass brooms manufacturers offers a variety of customized services such as LOGO, color, size, fabrics and more. For detailed workflows on customization, see the Customization Services manufacturers. If you still want to know more, please email us and we will answer them in detail.